Joyo's tiny and extremely affordable IronMan Series just keeps expanding - you'll note we have a number of the little fellas in our round-up of the best mini effects pedals - and the Nebulous Phase is the latest to join the roster. 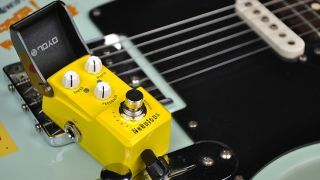 Based on classic modulation designs, the Nebulous is a four-stage phaser, packing speed, width and feedback controls, as well as Joyo's nifty flip-top lid to protect your settings. Given the size, it's 9V power supply operation only for this one, but true bypass switching comes as standard. The Nebulous Phase is available now for £49.99 from Joyo Audio UK.